Spiral scanners are advanced computer tomography (CT) scanners that use a spiral movement to yield a high resolution scan that produces 3D images of areas within the body. Spiral scanners were invented in the 1980’s, with the first single-slice device reaching the market in 1989. From that point the technology developed rapidly, leading to a steady increase in the number of rows of detectors deployed in each machine. In 2001 a 16-slice scanner was introduced and a 64-slice scanner was introduced three years later. Today, virtually all CTs in use are spiral scanners. A sixty-four slice spiral scanner can produce a complete image in a matter of seconds, allowing a complete volume data set to be acquired while all patient anatomy remains in one position. Spiral CT is also unique in that it provides detailed information of nearly every organ in the upper abdomen and pelvis in one quick examination. The data acquired from spiral CT is perfectly suited to three-dimensional reconstruction. Software and advanced computer systems allow amazing 3D "virtual reality" images to be created that are easy for physicians to read and utilize. Spiral scanners provide clear, accurate 3D images of complex blood vessels as well as excellent visualization of internal tissues, making them valuable for rapidly evaluating severe trauma injuries and allowing surgeons to visualize and plan reconstruction of complex fractures. Noninvasive CT-guided virtual endoscopy procedures allow physicians to see the inside of structures such as the colon and bronchi without performing invasive endoscopy procedures. These virtual endoscopies are particularly valuable in that they allow acquisition of images that could not be acquired via traditional endoscopy due to anatomical limitations or patient safety. Spiral scanners differ from earlier CT scanners in that the x-ray source traces a fast spiral or helical path around the patient, rather than an assembly containing a source that emits a conical beam and a 2D array of detectors rotating around an unmoving patient to obtain an image of a single slice at a time. 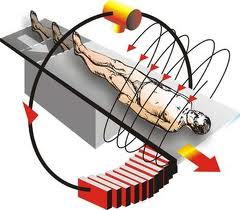 In a spiral scanner, both the source of radiation and the array of detectors are mounted on a gantry that rotates around the patient at a fixed rate, while the patient is slowly moved through the spiral. This enables fast and continuous acquisition of data from the complete anatomical area of interest.